I love the holiday season. It brings out the best in most people. There's so much joy and happiness in the eyes of children. Smiles and singing from young and old. But my favorite part of the holiday season is making and giving gifts to those I love, neighbors, teachers and friends. However, when you make gifts you have to start early, which means having a way to keep track of who you've made gifts for or what gifts you've bought. That's why I needed this printable Christmas gift list. I think I got this particular habit from my Mother. She use to have all her Christmas shopping done in July. She'd plan, shop the sales, find the coupons and figure out what we wanted WAY before we even knew what we wanted. She was also really good about keeping it even so no one felt bad about their gifts. My Mom has a talent for that. I on the other hand am a bit of a basket case when it comes to keeping track of what I've purchased or made for others. I'll make something in July and find it the next February having forgotten where I hid it. (Please tell me I'm not the only one with this problem.) Solution: this printable Christmas gift list. I seriously print this at the beginning of the year and pin it on my bulletin board. When I make or purchase a gift, I write it down. I usually have to print some extra pages, but it helps me keep track of what I've created. (If I'm smart, I note where I hid it too.) One year I kept my list in my planner, but it drove me crazy because it was loose and it kept dropping out. But that is another option for you. 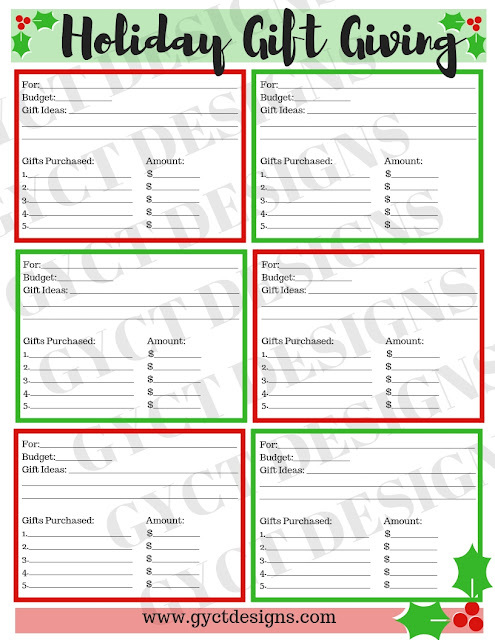 This printable Christmas gift list has a box for each individual you plan to gift something to. I personally aim for 5 gifts or less for my children. That is why there are five spots for gifts. You could be general and put "teacher gifts" and cover all the gifts for the teachers you plan to purchase from. I'm going to step on my soap box real quick. Teacher's deserve a little something at the holidays. Just think about how much you "enjoy" fight your children during the craziness of the holiday season. Their teachers get to do that as well. Yes, they get paid. But not nearly enough. Even a small gesture like a homemade card or a small sweet treat helps them know you appreciate them. Whether they are public school teachers, Sunday school teachers, or bus drivers. Give them a little love this holiday. Okay, I'm off my soap box now. So you can fill in each box for an individual or for a group of people. It's also a great place to write down that toy your 5 year old told you they really wanted and you know you'll never remember if you don't write it somewhere. So there is a spot for that. There's also a spot for adding your budget. Perhaps you have a set limit for each individual or for a group of people or a family. You can record you intended budget and keep track of how much each gift cost to purchase or make. This way you will remember throughout the season or the year exactly what limit you set your self. 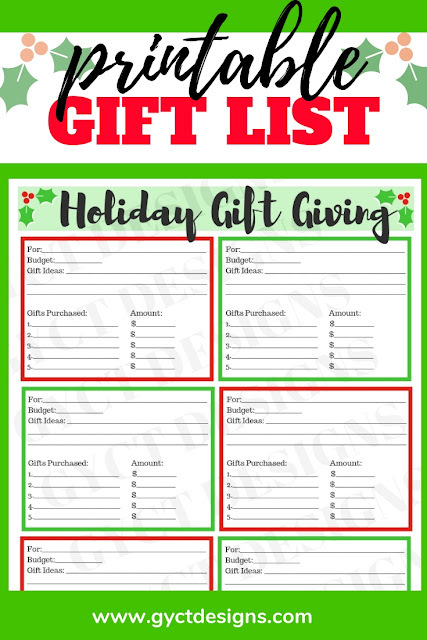 I hope this printable Christmas gift list will help you get organized this holiday season or at least help you keep track of some of the gifts you create this year. Happy Holidays! !